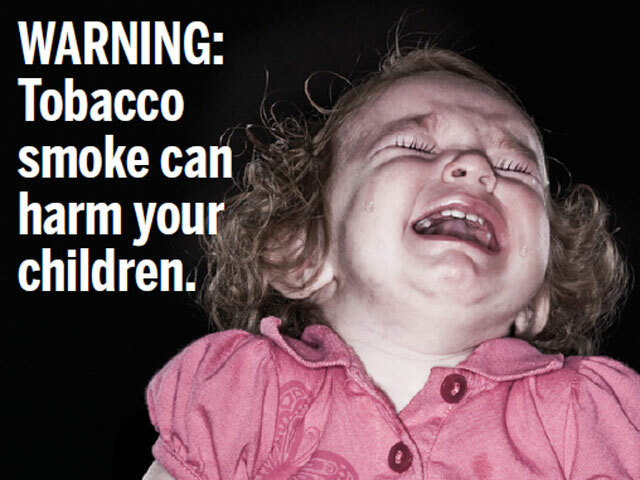 (CBS/AP) Can the federal government scare cigarette smokers into stopping with a new campaign of horrific images to be placed on cigarette packages? They're certainly going to try. Images of corpses, cancer patients, and diseased lungs are just some of whats in store in graphic new warning labels. The images are part of a new visual campaign announced by the Food and Drug Administration and the Department of Health and Human Services on Wednesday to reduce tobacco use, the Associated Press reports, which is responsible for about 443,000 deaths per year. The new prevention plan is part of the law passed in June 2009 giving the FDA authority to regulate tobacco, including marketing and labeling guidelines, banning certain products and limiting nicotine. The law doesn't let the FDA ban nicotine or tobacco entirely. "Today, FDA takes a crucial step toward reducing the tremendous toll of illness and death caused by tobacco use by proposing to dramatically change how cigarette packages and advertising look in this country," FDA Commissioner Margaret Hamburg said in a news release. "The health consequences of smoking will be obvious every time someone picks up a pack of cigarettes." The FDA is proposing 36 labels for public comment, which include phrases like "smoking can kill you" and "cigarettes cause cancer," but also feature graphic images to convey the dangers of tobacco use. The agency will select the final labels in June after reviews of scientific literature, public comments, and results from an 18,000-person study. Cigarette makers will then have 15 months to start using the new labels. Canada was the first country to begin using visual warning labels, introducing them in 2000. Now, more than 30 countries employ visual warning labels, including Australia, Brazil, India and Egypt. Some countries' labels are particularly graphic, like Brazil's, which include dead premature fetuses, post-autopsy cadavers, and gangrenous feet. While it is impossible to say how many people quit because of the labels that have been introduced, Hammond said every source of evidence suggests that the labels do help people quit. Given the population in the U.S., the impact of the warning labels could be "significant," Hammond said. Meanwhile, Reynolds American Inc., parent company of the nation's second-largest cigarette maker, R.J. Reynolds, is reviewing the labeling plan. But spokesman David Howard said the legality of the new labels is part of the lawsuit filed by the company, Lorillard Inc. and others pending in federal appeals court. The tobacco makers in the suit had argued the warnings would relegate the companies' brands to the bottom half of the cigarette packaging, making it "difficult, if not impossible, to see."